America–Playground Bully or Misunderstood Teenager? Some nations think of America as the menacing bully in the world’s playground. Whether you believe that to be true or not, it sure wasn’t always that way. In 1773, when America as we know it was merely a glint in George Washington’s eye, one of the most bizarre acts of rebellion occurred: The Boston Tea Party. This was no ordinary tea party, for not only was there an absence of cake, crumpets and scones, there was no tea. 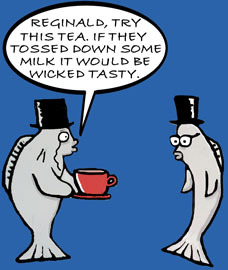 Unless of course you like your tea mixed with polluted, salty harbor water. 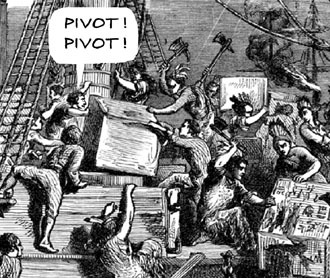 An invitation to The Boston Tea Party was a request to help move large, heavy crates from three tea-laden ships, only to toss said dried tealeaves into the harbor. Now despite being The Bay Area Brit, I’m no expert on tea parties, but it seems to me, it’s sort of like receiving an invitation to come over to a friend’s house for dinner, only to discover when you get there, he broke up with his girlfriend and has asked you, and three other friends (that you’ve never met) to come over to help him move all his crap into his new apartment on the other side of town. After which, you and his other friends will receive said dinner, in the form of beer and pizza as payment for five hours of manual labor. Well, at least you got the beer and pizza. A guest at The Boston Tea Party was perhaps to enjoy a strained back or a double hernia and never received tea or the aforementioned cake as payment. In 1773 the British were having a hard time getting taxes from the colonists and so, as a (not so) cunning ploy, decided to levy the tea, figuring that they would reap their money back knowing full well that the colonists could never go without their morning cuppa. Wrong. The British overestimated just how good their tea was. Thanks to America’s forefathers, things are different now; 21st Century Americans guzzle billions of gallons of tea per annum. Teahouses are now cropping up all over the Bay Area ensuring that tea drinkers can taste their favorite blend and try many eclectic varieties not readily available at their local market. The Boston Tea Party was historically significant, but probably only appreciated by Americans for its importance after the dust had settled. The action of dumping thousands of pounds of tea was a metaphor, like teenagers singing their favorite song of protest from an upstairs bedroom in their parents’ house. Of course, I’m making light of an important political and historical show of defiance. However, the next time you get ruffled when your child launches his creamed corn at a wall in protest from the dinner table, remember what Britain and America learned from The Boston Tea Party. Perhaps what your impetuous child is actually saying is, “I learned this behavior from America’s forefathers, and, Mom, I don’t want creamed corn for dinner again; I want tea and cake.” And as a parent you should consider that maybe your creamed corn isn’t that good, and by forcing it on your kid, it will bring resentment until one day they finally crack and empty the contents of the fridge and cupboards into the garbage can. Also, next time you get an invitation to a party, be sure to read the fine print or you might end up with a slipped disc or do something that will be remembered centuries from now as a turning point in which your country transformed from being a rambunctious child into a misunderstood teenager. Enlightening Matty, I second your thoughts upon our lil’ America as an embodiment of misguided teen angst. Nevertheless, if the world were a teen movie, America would be the rich kid who is captain of the varsity football team, dates the head cheer leader, drives a Porsche, but is an utter complete douche bag.